On April 19, 14 years will have passed since Wayne Gretzky, holder of 61 NHL records and known as ‘The Great One’ for numerous reasons, played a competitive NHL hockey game. For many hockey fans, there are countless memories of Gretzky… goals, milestones, awards, Stanley Cup and Canada Cup games, The Trade. But, time passes and today there are junior-aged hockey players who have no real memory of seeing The Great One play live. Today it’s easy to find video on YouTube or NHL.com. 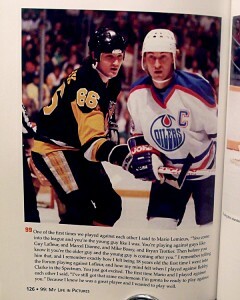 It’s not like Gretzky is completely unknown to even the younger generation. But, as good as video is, sometimes nothing can compare to the magic of photography. It’s historic, and by it’s nature, photography captures a moment. 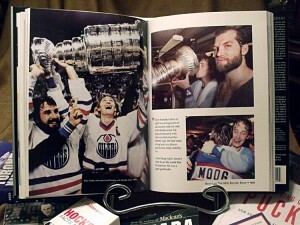 In so many ways, hockey and the NHL are built on such a rich history, a collection of so many thousands of moments. 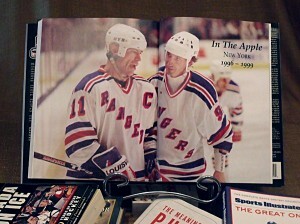 Not long after he retired from playing, 99: My Life in Pictures hit the bookstores. And it truly is a wonderful collection of moments, both the public and private, that made up the incredible career of the game’s greatest player. 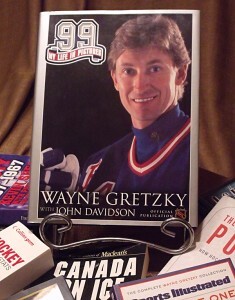 The foreword is written by John Davidson, whose own playing career was wrapping up as Gretzky’s began to dominate the NHL, but who, as a broadcaster, got to know Wayne quite well. Unlike most books, the foreword is 20 pages – a lot by most standards. But Davidson is providing context, an overview of what will follow, and insight into the man Wayne Gretzky had become by 1999 and what he meant to the game. Really, Davidson’s foreword is the only part of this book that relies on words rather than imagery to tell the story. That’s because the rest of the book is pages and pages of pictures, broken up only by Wayne’s own descriptions and recollections. Wherever Wayne is writing, a ’99’ appears. This is truly his ‘Life in Pictures’, from the rec room and backyard rink on Varadi Avenue in Brantford to the Soo to centre ice at Madison Square Garden. Unsurprisingly, there’s pages of young Oilers, including Messier, Kurri, Lowe and the rest, and many of the career milestones are featured, including the 1,050th assist, 802nd goal and 1,851st point. And of course, there’s the Stanley Cups. And there’s the move to Los Angeles, and what would become the introduction of hockey to the Sun Belt. The years Wayne was a King are well-represented, not just with NHL action pictures but also pictoral references to Gretzky’s other ventures – part-ownership of the Toronto Argonauts, the restaurant, etc. And that’s followed up by his brief stop in St. Louis and finally, the New York years, where Wayne teamed up with Messier and many former Oilers to try to reach hockey’s pinnacle one last time. Not every picture is of the highest quality of course, especially the family snapshots. But they help paint the picture of your everyday average Canadian kid growing up in southwestern Ontario in the 1960s, on his way to superstardom as the game’s greatest player of all time. And the professional photos of game action are some of the highest quality shots that the NHL’s photographers are known for. 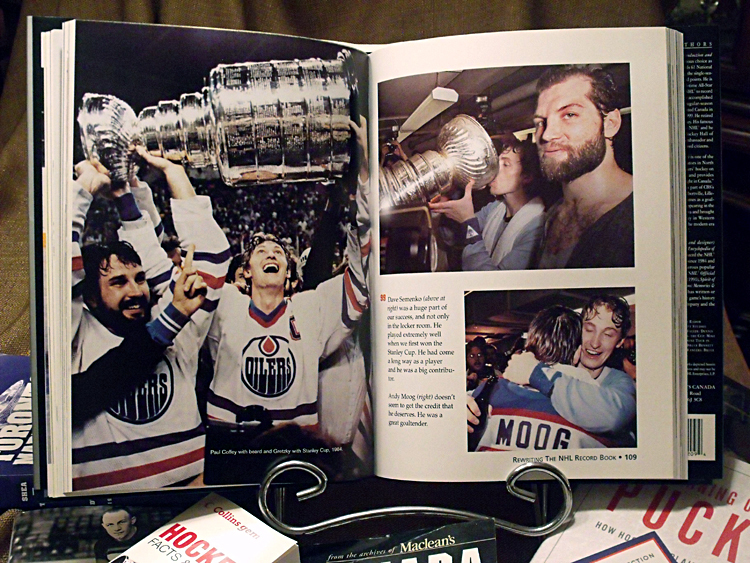 99: My Life in Pictures is a visually appealing and beautiful book that captures some of the best moments the game has seen. It is a great reminder of those high-powered years when NHL offence was at its peak and would be an important piece of any hockey fan’s collection.